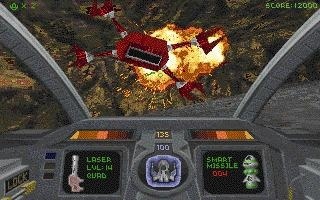 Do you have a hankering to play classic 1995 not-quite-space shooter Descent these days? If you do, you ought to keep an eye out on WiiWare. 1995's Descent was quite a few things. It was (and is) a beloved retro classic, held up as a member of the heyday of space shooters. It was a nausea-slash-vertigo simulator for some, who found themselves getting lost in the endless mine tunnels of the Solar System. It was the beginning of a franchise that led to what is considered by some to be the finest space shooter ever made: Descent: Freespace. Oh, and it's also coming to the Nintendo Wii as WiiWare. That's right, you'll be flying your MD1032 Material Defender through the series' six degrees of movement (up/down, left/right, forward/backward) with the Wii Remote. "Descent remains the most popular 1080 degree 3D blasting game. Translating its 3D worlds and gameplay to WiiWare is an exciting move", said Herve Caen, CEO of Interplay. I don't disagree with Caen's statement, but isn't "1080 degree 3D blasting game" kind of, er, specific? "Descent will pair perfectly with the motion-sensing Wii Remote controller and we can't wait to show players how intuitive the gameplay and control can be," said Scott Hawkins, founder of G1M2, the developer that will be working with Interplay on the project. I know I can't wait to get lost in a dizzying series of tunnels all over again! Who's with me?